These three telescopes all date from around the turn of the C19th, in other words 1800. I don’t think they can be dated better than that, but there are discussion points that can be used to suggest they are earlier. The first, the smallest and maybe the oldest is a single draw in a French polished wooden – that could be mahogany – round barrel, about an inch and a quarter diameter. The original polishing was badly damaged, so I re-polished it, and the result was really good. Closed it is 10.25” long, the main barrel being 9.5” long. The draw tube itself, without the eyepiece end, is 9” long, so occupies the whole barrel when closed up. Approx 5.5” of this draw is extended at the focus point, and there is a line scribed on the draw to show where to pull it out and stop. Maybe this was needed, because there is no end stop, the draw pulls right out: this is a characteristic of older telescopes, ie before 1800. Two further aspects of the inscribed line: the focus has a fairly wide tolerance, so it can be easily set up by eye against the marked line. Second, the draw is fairly tight in the barrel (still, after 220 years), so the lack of an end stop does not let the brass section slip out when holding the telescope. There are then four further lines obvious on the draw tube, and these are all screw threads joining short tube sections. So four such break points leads to having four lenses along the body, plus various apertures to restrict the light paths allowed through. Then, under the shaped eyepiece there is a fifth lens, so I need to find out whether this was common, and when five lenses were used – it is possible this leads to an earlier than 1800 date. 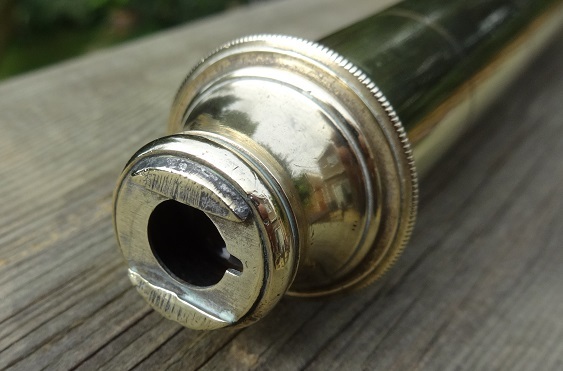 The eyepiece itself has a groove across the top, which would have taken a brass cover, held in place by a small screw that located in the cut-out visible. I guess this was over-engineering, as many of the users of such a telescope would have found this piece of metal sticking out either hit them in the eye when the ship lurched to one side, or maybe was flipped out of the groove when knocked at any time. Actually I’ve never seen one of these flaps in place on any telescope! At the objective end the lens cover is the more conventional slide, which is still in place, but shows signs of damage, as most of these do. Such slides are always difficult to polish – unfortunate here, because the objective cover slide, rather than the first draw, carries the maker’s name. 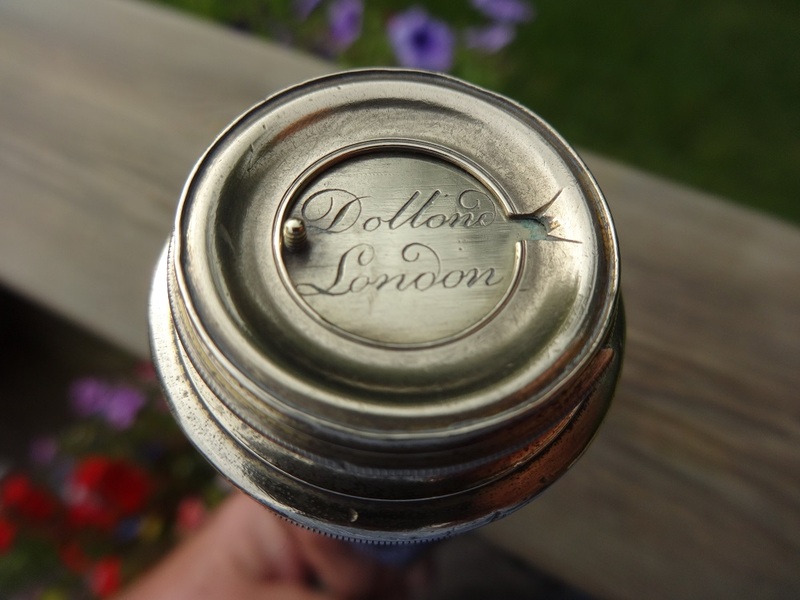 Here it is easily read as “Dollond, London”. Seeing this enabled me to identify some “scratches” seen on a similar slide, on another telescope, as a rubbed-out Dollond signature. Differing from other telescope designs, the sliding cover does not unscrew and leave the lens in place: if you unscrew the sliding cover assembly, it brings the objective lensassembly (pair?) away with it. The diameter of the glass available to collect the light is 15mm, or around 0.625”, which is very narrow, compared to later ship’s telescopes, which might have had 2” objectives to collect as much light as possible. But to do this they relied on the Dollond patented objective lens combination of crown and flint glasses. 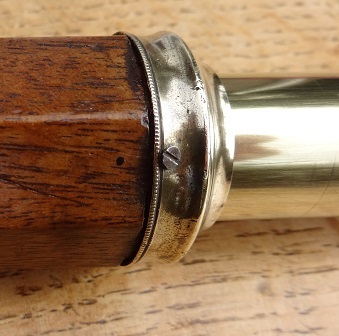 Then, the most frustrating thing with any telescope of this age, the screws holding the brass pieces to the wood are incredibly small, and I have not found a suitable modern source. There are three screws needed at each end of the wooden barrel, and this scope has two of them, the original ones, present at each end. This scope was bought in 1997 from the London Scientific Instrument Fair, from Swindon based Tim Collins, who had a Portobello Road stall in London as well: it is my reference 39. He suggested it dated from around 1760. The Dollond patent on the objective lens combination was dated 1758. 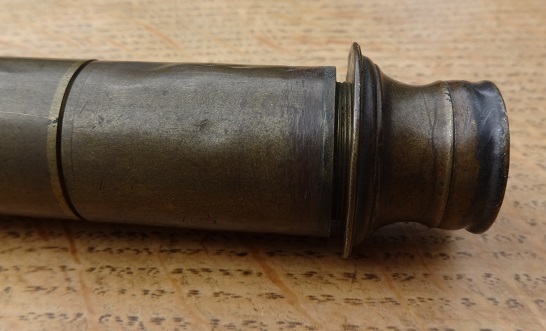 This objective is lapped into the brass, so cannot be inspected, but is not that thick: it has a convex face facing the outside world and a flat face on the rear side. If you look in the distance there is no colour fringing evident, but looking at the sky and angling to see the edge, maybe this does look yellowed. So maybe the design is using a narrow diameter objective, and small apertures in the lens assembly, to avoid the problems of chromatic aberration at the edges of the view. It took a long time to acquire the next telescope in this family. I just wanted another eight sided one, as typical of the scopes that were used on older sailing ships! That was my impression. Anyway this one came from Ebay as a “Buy it now” in March 2013, for £230, and is number 182. It was quoted as circa 1790. The first comment has to be that this telescope has no name, so it’s a copy of someone else’s design. So its maybe later in date than the design might indicate. 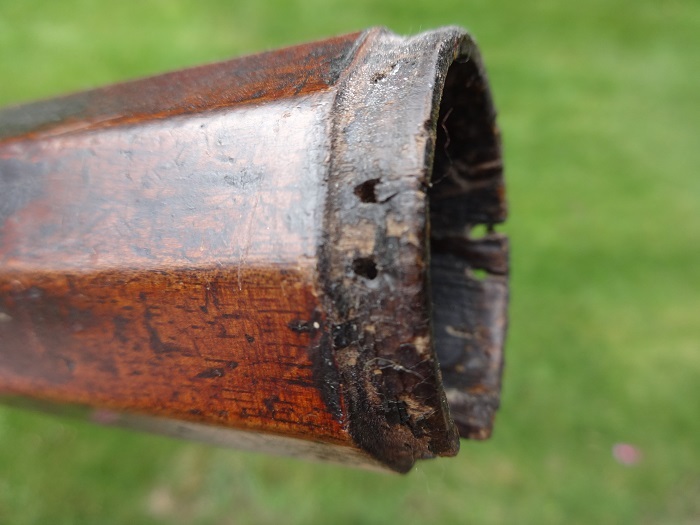 Plus maybe two of the screws into the wooden main barrel are original, and there is a dent in the main draw where a new screw has been inserted that was too long – it’s a problem I have met too! 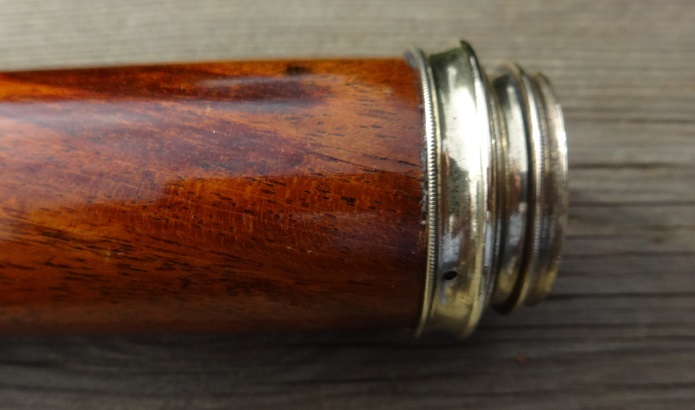 The barrel appears to be made of oak, shaped from a single piece and then polished. Closed the telescope is 13.5” long, fully open its 22.75”. 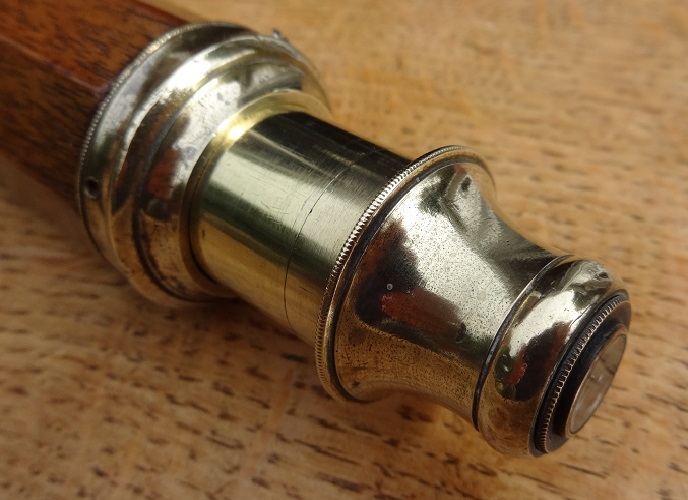 Again there is a mark on the first draw to show where the main focal point is located: but the brass draw does not pull out of the body, there is a stop provided. The first draw has two splits along its length to insert lenses, plus a third close to the eyepiece. There is then an eyepiece lens almost proud of the rear end of the telescope, totally unprotected, and there is no evidence of an earlier cover being attached here to protect it. So it is a more conventional 4 lens system in the first draw. The objective lens, however, does have a standard slide for protection. 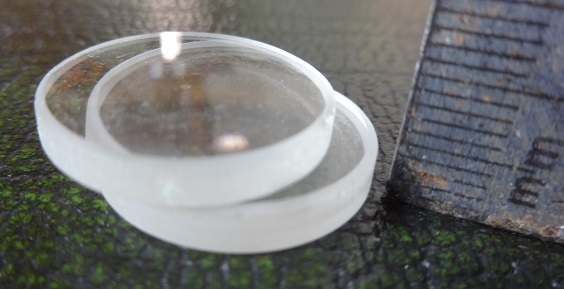 Unscrewing the slide removes the whole lens assembly, which is of two lenses, both very thick: in contrast to other later standard models where the outward facing convex (crown glass) lens is very thin. This telescope has double the magnification of the Dollond quoted above. It works well, although the draw tube is stiff. Added here as a work-in-progress item is another larger scope that is ten sided. I bought it as a wreck on Ebay in September 2012, for around £100: it is number 165. It was bought as a renovation project, as there was no objective lens, and no name. 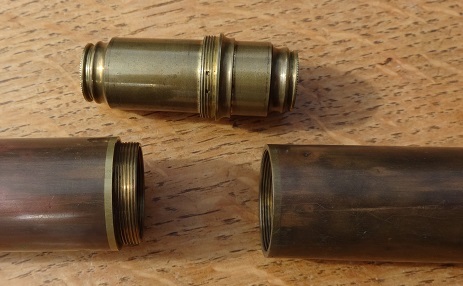 Within a month, never seen before on Ebay, there was a brass objective lens carrier advertised, Dollond named, no lens, in a size that would have fitted fine. Regrettably the winning bid was over £100, just for the brass assembly! I failed to go that high. So the pictures here are for record to see where it gets to when treated with TLC. 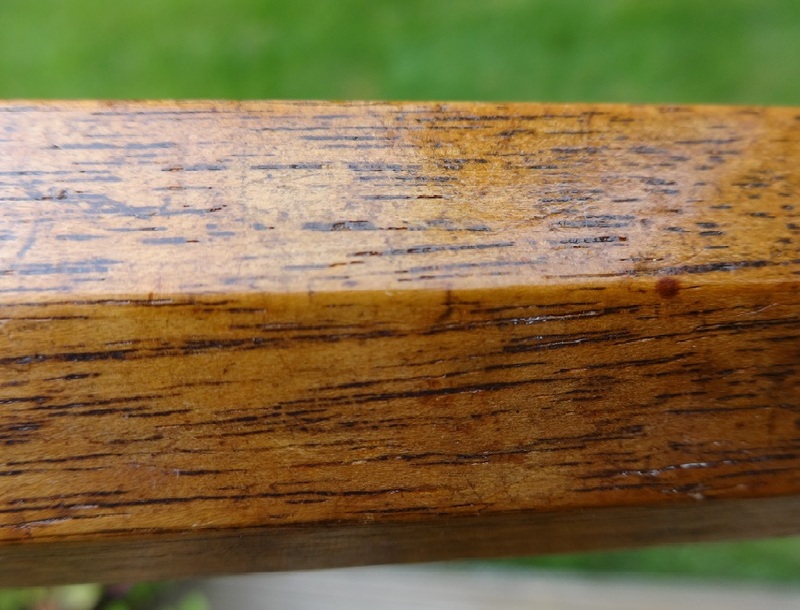 It looks like it was originally French polished and is oak. The main barrel has split, so there is a brass strap to hold it together. It is 18.25” long, and the screws in the one end fitted are not original. The brass draw pulls straight out, and has splits to create a 5 lens construction. But there are only three splits in the tube, plus one eyepiece lens: the second tube split has a lens carrier with two lenses, one at each end. When focussed to the mark, the total length of the telescope is approx 29”. Lacking a proper objective carrier, the interim plan is to use an objective doublet from a (trashed/squashed) Dollond WW1 Scout Regiment scope as the objective, right size/focal length, to show the old girl working (See top picture). Believe me it works, but the focus point has changed a lot, it is much shorter. The magnification is around that of the 1760 scope quoted above, ie not very much, and there is currently some barrel distortion. Possibly the five lenses are in the wrong order, or the wrong way round! There’s a few combinations to try there, as the Dollond lens worked fine in its original, bashed structure. All of these are for sale, to someone who wants to take them further. Possibly the lenses from the wreck, number 3, might help with a current re-build project on a Ramsden scope! Then it can be polished and cleaned, to make it interesting. So without a working solution it is only worth around £600: a new objective lens carrier without the lens would be around £200 – I’ve only ever seen one sold as a spare.. The other two telescopes, complete, are valued at £1200 each. 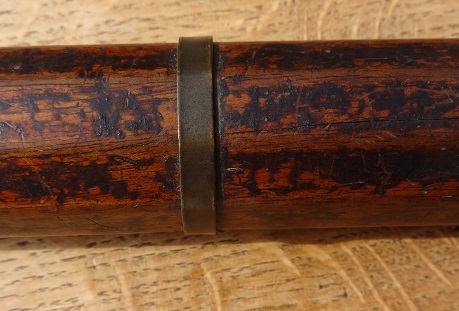 I found this forum whilst doing some research on a telescope I bought last year at an Antiques Fair in NSW Australia and would like some help in confirming the date it may have been made. It is a single draw scope – 64cm when closed – 76.5cm extended – Tapered barrel leather covered mahogany 5.5cm dia with plated metal parts. It is Marked “Dollond London” there was some engraving underneath this but it has mostly been filed off. Would appreciate any help in getting some idea of the age of this scope. Can send photos if you get back to me with an Email address.